3 days. 12 hours total. the math is really hard. allowance 3S should be added to every edge which will be stitched with another piece of fabric — and that one should be 2S. for example, at the bottom of the tote bag, the cut-out right angle between the bottom and to-be side does not need to be 3S vs 2S because it’s attaching to itself. yet, i’d like to roll it over to hide the raw edge, so i could add 3S to each side. no need to make these 2 edges have diff length than the other half’s fabric has for this same section. why does back look ugly? tension? speed? pulling the fabric? maybe i need to replace the needle. It's hard to know every dimensions a priori; that's why prototyping w/ real fabric is vital -- I had prototyped with newspaper, but that wasn't sufficient, as I didn't roll down the roll-top and thus didn't know how much fabric would be needed. As a consequence, I underestimated the amount needed for rolling and thus my torso was really short. from /u/tri_wine: Build each panel first. Whatever straps, buckles, etc you want on that panel should be attached to each. Then attach all the panels together, inside out. Each side gets sewn to the bottom panel, then the front panel gets sewn to the bottom and sides, then the back panel. All the buckles and straps and junk should now be on the inside of the pack. Avoiding catching a cinch strap in a side seam is part of the fun. Raw edges look bad. I'm against grosgrain because it adds weight, although I'm told it would help have even stronger structure. I'm for faux-felled, per the reddit messages from someone. Blue looks cool, but for a serious bag, I'm against it. I'd prefer black. Took 2 days. Probably 6-10 hours. Wanted more practice w/ basic stitching, measuring, cutting poly/nylon, and other sewing skills before embarking on anything bigger. measuring, marking, and cutting everything w/ precision takes forever. accuracy is vital; the cut was a little off, and i thought i could salvage it via folding properly. i couldn't. things became crooked and consequently uneven w/ the fabric. always turn the hand wheel towards you -- i spent 10 minutes trying to figure out why the bobbin wasn't properly catching, as i tried to re-thread. the tables may look clean, but they probably aren't. my fabric became very dirty. sewing w/ precision requires paying attention to the exact hole that was pierced w/ the needle -- after adjusting/moving fabric, try to align the fabric such that the machine will continue from exact same hole. when sewing straps or other things which involve adjust the garment in the middle of a sewing line, work on trying to make it all 1 straight line -- not sure how i'm messing up, maybe don't stop while the needle is up? leave it down within a hole? keep two pairs of scissors handy: 1 near machine for trimming every thread; 1 by fabric measuring/cutting area. make sure the needle is well into the fabric before sewing. square corners are hard. not sure how to make them perfectly align -- maybe the discrepancy in edges was due to the edges being not 100% equal? My first two attempts at making X stitches. Try to guess which was my 1st attempt. 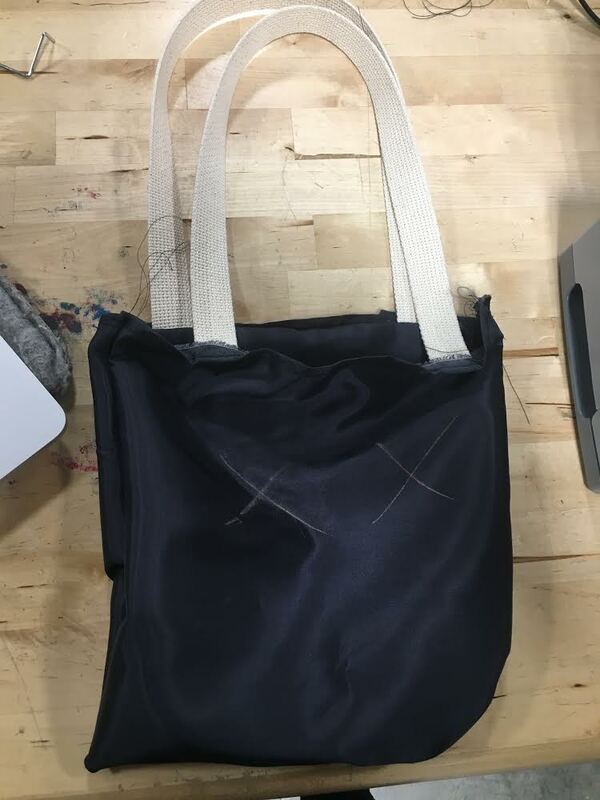 My first legit, finished tote bag! (One on first day doesn't count because I didn't measure anything, I didn't have to make the handles, and I didn't properly stitch the handles).